How Crowded is Walt Disney World? Predictions did very well this week with only one exception. We saw moderate crowds all week including a surprising, but correctly predicted level ‘5’ on Easter Sunday. Resort wide, every day was either a ‘5’ or ‘6’ on our scale. Let’s look at how the crowd levels stacked up each day last week. Sunday’s resort wide crowd was a level ‘5’ as predicted, much lower than one might expect for a major holiday. We think our models correctly predicted this crowd because most schools had already finished Spring Break and those that hadn’t were heading home to prepare for the return to school. We also hit the mark at Magic Kingdom with a prediction of ‘6’. Our resort wide prediction was correct again on Monday, a level ‘6’. 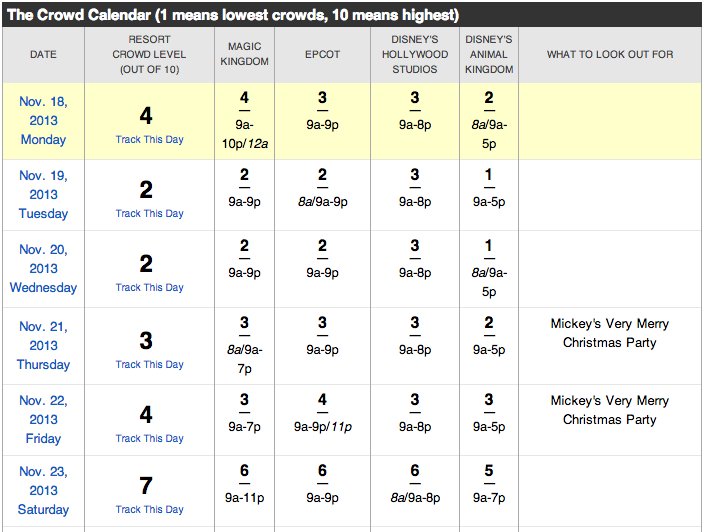 Magic Kingdom (7) and Animal Kingdom (6) came in one level higher than predicted while Epcot (5) and The Studios (4) were both two levels lower than we predicted. Six (6) was the resort wide number on Tuesday but this time it was one level higher than expected. Extra Magic Hour at the Magic Kingdom matched our prediction of a crowd level ‘7’. Epcot was the surprise on Tuesday, a whopping four levels higher than the ‘4’ we predicted. Mission: Space (Green) and Soarin’ were the culprits that drove up wait times but the crowds were surprisingly moderate at Test Track (75 minutes). Our predictions hit the mark across the board on Wednesday, a perfect sweep! Magic Kingdom and Animal Kingdom were the only parks to reach a level above ‘5’ and they only topped it by one level. The Studios was the best park as predicted with its level ‘4’. Epcot matched the resort wide level, both were a level ‘5’. Sixes were popular again on Thursday with both Kingdoms and Epcot reaching a level ‘6’. These three parks pushed the resort to a ‘6’ overall despite the lower wait times at The Studios (a level ‘4’). The moderate crowds of the week continued again on Friday with yet another resort wide ‘6’, one level higher than the ‘5’ we predicted. Once again, no park reached a level higher than ‘6’ and once again, The Studios was the lone park below average at a level ‘4’. All predictions were spot on or within one level. Same story on Saturday, in fact all parks reached the same level that they did on Friday. Overall, this was higher than we predicted with our estimate of a resort wide ‘4’ and a ‘3’ and ‘4’ at The Studios and Epcot, respectively. Animal Kingdom, while hosting Extra Magic Hours was a ‘6’ as predicted. Late April and Early May is a great time to visit Walt Disney World if you are not fond of crowds, especially early May. We don’t expect crowds to rise above average until late May. Watch out for Star Wars Weekends and Memorial Day, otherwise touring is generally relaxed. Note that Magic Kingdom is open for 24 hours on May 23. Why is the actual calendar showing November dates? Thanks!